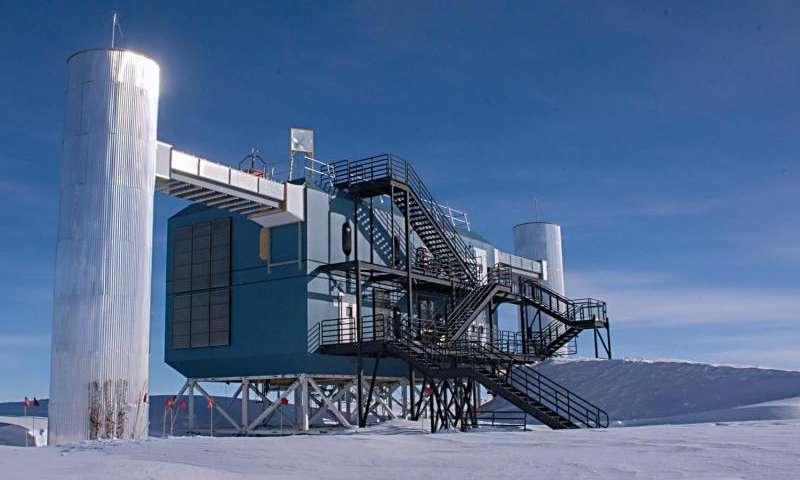 The National Science Foundation (NSF) today announced that it has renewed a cooperative agreement with the University of Wisconsin-Madison (UW-Madison) to operate the IceCube Neutrino Observatory, a massive particle detector buried deep in the ice beneath the South Pole. In 2013, IceCube researchers made an important contribution to astrophysics when they reported the first detection of high energy cosmic neutrinos, opening a new astronomical window to the universe and some of its most violent phenomena. The five-year, $35 million cooperative agreement calls for the continued operation and management of the observatory, which is located at NSF's Amundsen-Scott South Pole Station. The agreement begins April 1, and may be renewed for another five-year period if the detector and collaboration continue to operate successfully. Funding for IceCube comes through an award from the Division of Polar Programs in NSF's Geosciences Directorate and from the Directorate for Mathematical and Physical Sciences (MPS) Division of Physics. Through the Division of Polar Programs, NSF manages the U.S. Antarctic Program that supports researchers at universities throughout the country. The program also provides infrastructure to support researchers in the field. "NSF is excited to support the science made possible by the IceCube Observatory because it's at the cutting edge of discovery," said Scott Borg, head of Polar Programs' Antarctic sciences section. "But to make ambitious research of this kind a reality requires cooperation within the agency, which is why we're delighted that our support for IceCube is in partnership with MPS. It's also science on a global scale, relying on strong international cooperation to be successful." The collaboration that operates the IceCube observatory includes individuals representing 47 institutions from 12 different countries. It includes sub-awards to the Lawrence Berkeley National Laboratory, Pennsylvania State University, the University of Delaware, the University of Maryland, the University of Alabama at Tuscaloosa, Michigan State University and the University of Wisconsin-River Falls. Since IceCube's inception 15 years ago and the completion of its construction five years ago—centered around a detector array consisting of 5,000 optical sensors frozen in the ice a mile beneath the South Pole—has been administered through UW-Madison, in recent years under the auspices of the Wisconsin IceCube Particle Astrophysics Center (WIPAC). "This is extremely good news," says Francis Halzen, a UW-Madison professor of physics and the principal investigator for the project. "Over the years, we have come to know what it takes to successfully operate the detector." IceCube was the first scientific instrument to detect ultra high-energy neutrinos from beyond our solar system. The neutrinos packed a billion times more energy than those detected in conjunction with the 1987 supernova observed in the Large Magellanic Cloud. Recent reports from the IceCube collaboration have confirmed the observatory's detection of high-energy neutrinos from beyond our galaxy—so-called cosmic neutrinos. Neutrinos are nearly massless particles created in nuclear reactions and. In nature, they are created by some of the most energetic events in the universe. Scientists believe colliding black holes, the violent cores of galaxies, supernovas and pulsars accelerate neutrinos, many billions of which pass through the Earth every second. Because they have almost no mass and rarely interact with matter, they are extremely difficult to detect and require instruments the size of IceCube—which occupies a cubic kilometer of Antarctic ice—to capture the fleeting bursts of light created when the occasional neutrino crashes into another particle. But the elusive qualities that make neutrinos so hard to detect also make them interesting to scientists. Since the particles glide through space unhindered by stars, planets and the powerful magnetic fields that pock the universe, they remain virtually pristine and harbor valuable clues about their yet-to-be-confirmed sources. IceCube has proven a workhorse of a telescope, according to Halzen. It remains operational 99 percent of the time, and has so far detected more than a million neutrinos—"A few hundred of which are astronomically interesting," Halzen said. "Five years ago, it was about discovering cosmic neutrinos. Now it's about doing astronomy and particle physics with them," notes Halzen of the quest to follow the particles' tracks back to their sources, a feat yet to be accomplished. Olga Botner, the IceCube collaboration spokesperson and a professor of physics and astronomy at Sweden's Uppsala University, said that "All over the world, IceCube is considered the flagship of neutrino astronomy." "IceCube's discovery of extraterrestrial neutrinos is a major breakthrough and a crucial first step into as yet unexplored parts of our violent universe," she said. "It also represents a step towards the realization of a 50 years old dream—to figure out what cosmic upheavals create the ultra-high energy cosmic rays, detected on Earth with energies millions of times larger than those achievable by even the most powerful man-made accelerators." Headquartered at UW-Madison, IceCube includes a staff of nearly 60 scientists, engineers and technicians in Madison. "There are many technical challenges underlying the operation of a large neutrino observatory at the South Pole, that would be hard to anticipate," says Kael Hanson, IceCube's director of operations and a UW-Madison professor of physics. IceCube's complexity, ability to gather large data sets, and standing among the world's frontline astrophysical detectors makes it a contributor to emerging computational technologies for managing and analyzing novel scientific information. Halzen says the performance of the IceCube detector has steadily improved and a key goal will be to speed up the analysis of neutrinos of interest in order to quickly alert other observatories. "We're going to detect interesting neutrinos in real time and we can send word to other observatories," Halzen said. "If we can do it in real time, we can be much more effective and we can alert, for example, optical observatories and other detectors" for combined observing. If neutrino detectors, and possibly also gravitational wave detectors, can provide early warnings to other telescopes, "We might have the astronomical event of the 21st century," Halzen said.